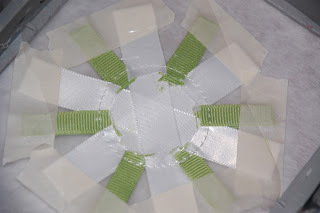 So, if you remember, we left off on our rick rack tutorial with promises of finishing our design using the frayed technique. I know I'm in the minority when I say "frayed" but "raggy" reminds me of scruffy or ragged, or "on the rag." Hey, that's just how my mind works. So, I go with frayed instead. And we are halfway done on our applique. Next is to get that cute frayed look. Your file will stitch a placement line. You will need to cover that line with some fabric. I choose two layers of the same. 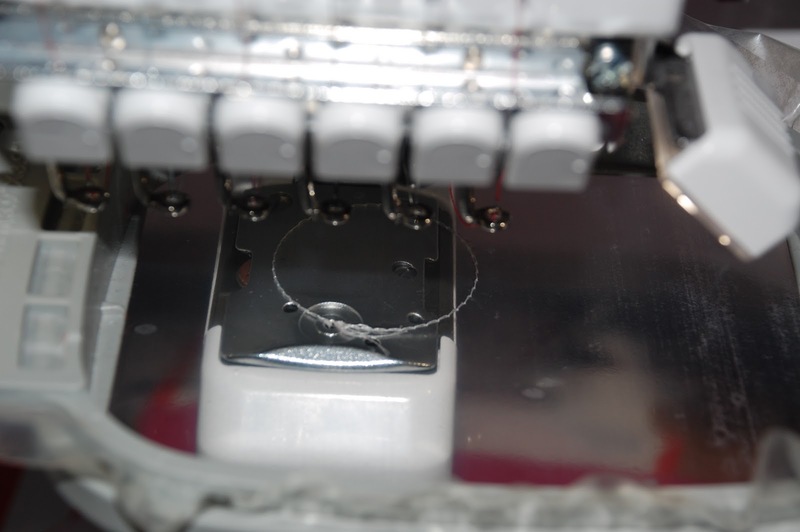 Whatever you choose, just make sure you've read your machine's instructions on how many layers are possible to embroider through on your specific machine. They are all different! After I added the fabric, my tackdown line stitched. This is a great thick tackdown line! 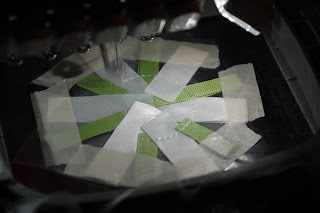 Also, I will sometimes cut out some Heat H Bond Light to cover the back of the area of fabric (trace placement line, trace HNBL, secure to back of fabric, line up over placement line) to secure it for many washings to come! Now, hopefully you loosely trimmed the area around the tackdowns. 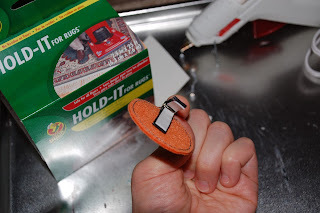 Go back and loosen the fibers of your fabric either using your fingernails or back of scissors (if you don't have that gene for pretty nails) or an old credit card. And very easy to do! 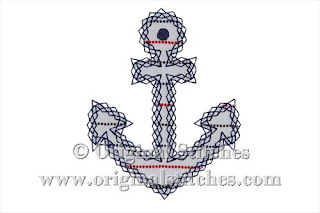 .....................you can do this with almost any applique design you have! I'm being completely serious. 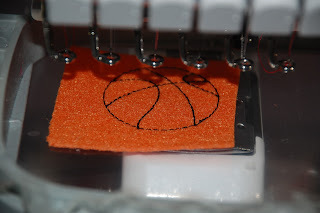 You can either stitch out your design using the wide satin stitch but not trimming your applique. Just think of the cute hearts you could be making with the fray! 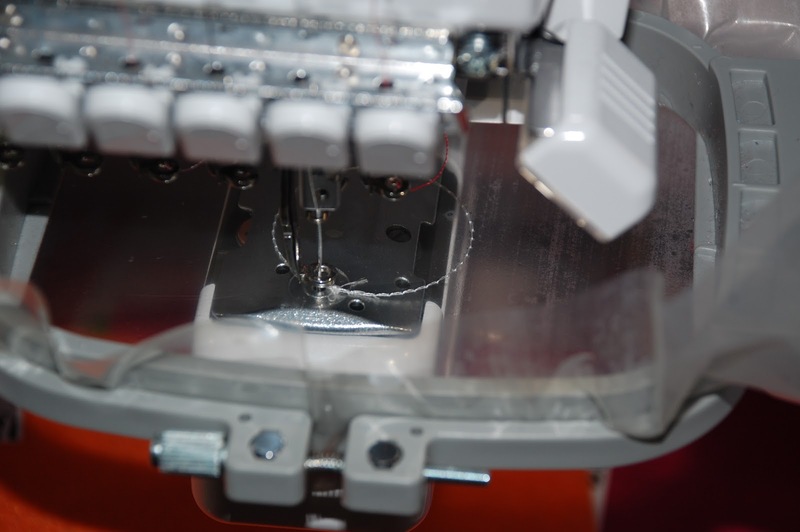 Or, you can run your tackdown stitches multiple times (usually 3) to secure your fabric and skip the satin stitch altogether! 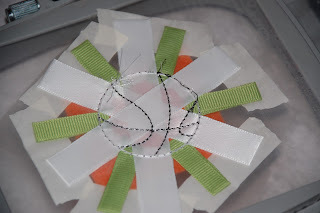 Now, isn't it good to know I just doubled the amount of applique designs you currently have? Well, now I've gone and done it! I created a design that uses rick rack. Let's be honest about the main reason I stayed away from rick rack. I'm cheap. Rick rack is something else I'd have to buy AND store. Anyway, back to using rick rack on your designs. Stitch out your placement line. See them on there? I can't really either. Now, take a look at your rick rack. You can do several things to seal or hide the frayed end including fray check. Line your rick rack OVER your placement line. 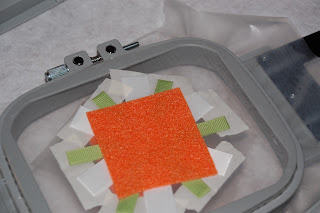 If part of the rick rack will be covered by an applique, make sure to leave enough extra so you won't have any peaking out under your design. Rick rack comes in different widths! 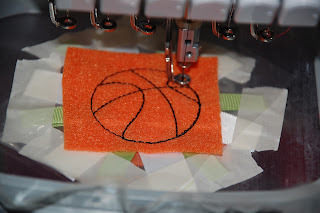 You can trim after your covering applique placement line is stitched. 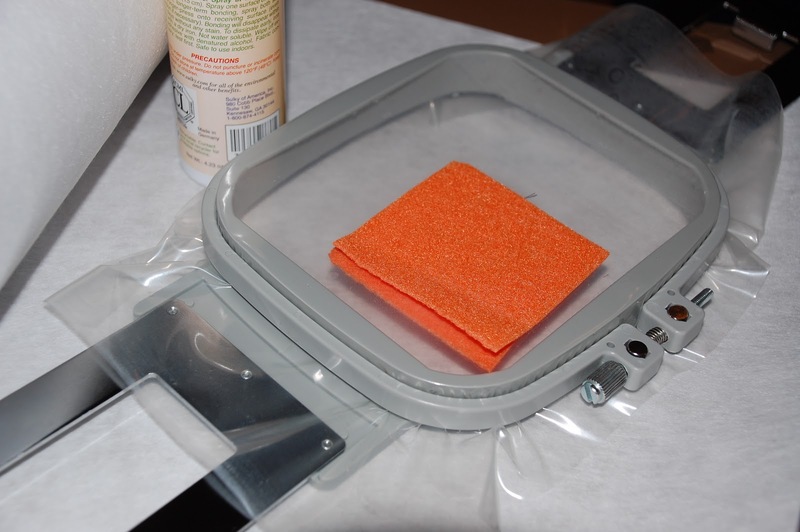 If you still want a clean edge for your rick rack, fold it under. You can use adhesive spray to hold it in place or something else. I "may" have used regular old tape. (cough, cough) No, I don't think that is approved for embroidery machines, but I was out of WSS and didn't want my foot getting caught on anything while stitching. Stitch out your tackdown lines. Let's hear the "ahh's" now. Just pretend this is wss and that I wasn't gumming up my needle. I did not fold over the tops since I will cover them with some fabric. 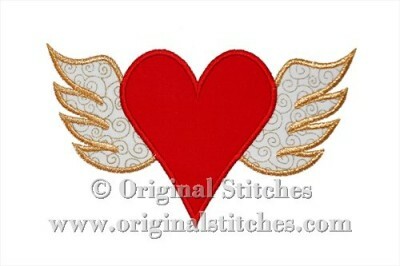 Not a traditional applique stitching either! 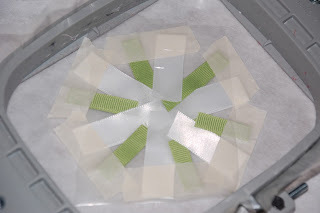 But, I will continue with how to get the completed look in my next post :) The frayed technique. Now, does anyone know if it is "rick rack" or "ric rac?" 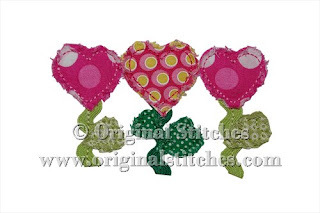 Our January Freebie has been listed on Facebook for a few weeks now! 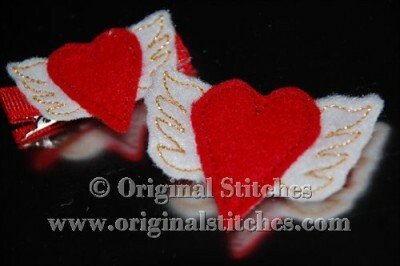 It is now listed in the tab to the left as a Free Instant Download on the blog too! And don't forget the matching felties! 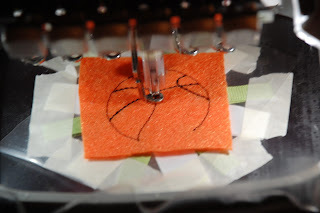 Comment on a page or blog tagging or linking Original Stitches. The first five comments I receive back on this blog with valid links will receive them for FREE! 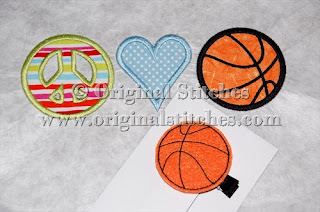 Quick Tip: Adding ribbon to your felties. How many of you use your design files exactly as the notes specify? Sometimes I add my own flair. 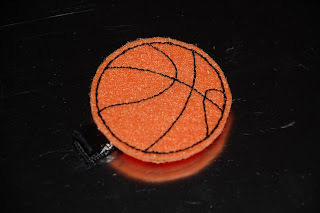 Let's go back to that basketball feltie. Placement lines are sometimes annoying, especially if you are stitching out a lot and you know what you are doing. Skip them! But, placement lines are perfect for those of you who haven't made a feltie before, OR want to add a bit of flair to your feltie. Here we go again. Stitch out that placement line! Now, instead of adding felt, add some ribbon! Any way you want! Go back and stitch that placement line A SECOND TIME! 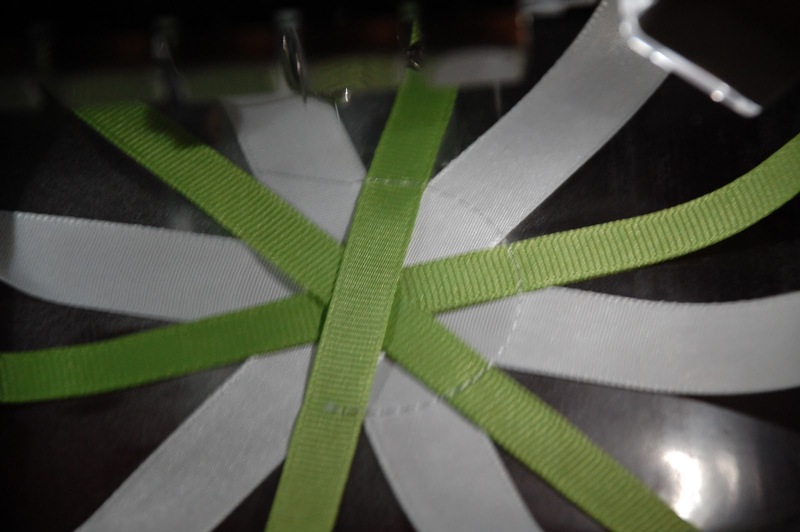 Next, fold your ribbon in using tape or adhesive to hold in place. And stitch that placement line A THIRD TIME! Next, unsnap your hoop and trim a bit of that ribbon away. Now, continue with the design. 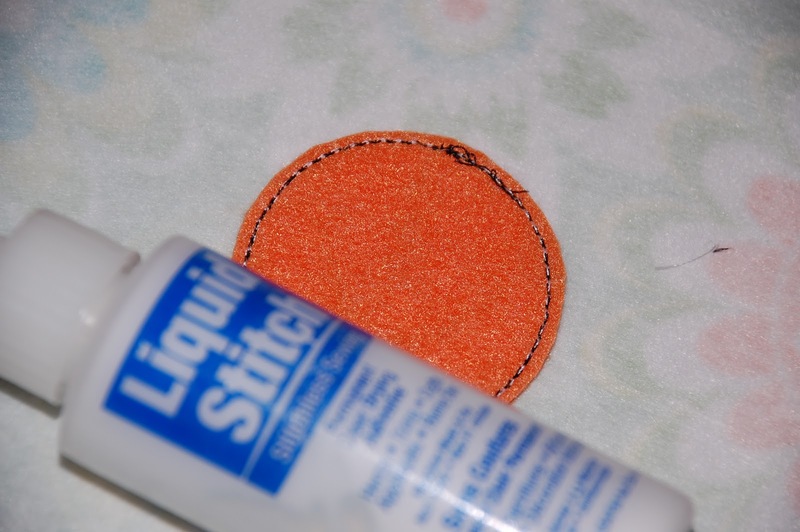 Add your felt and stitch your tackdown lines. Stop, unsnap your hoop and look at the back. 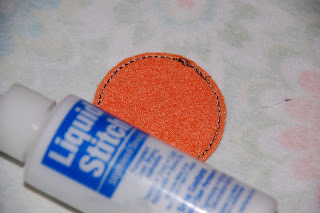 Using adhesive spray, add a layer of felt to the back/bottom/underside of the design. 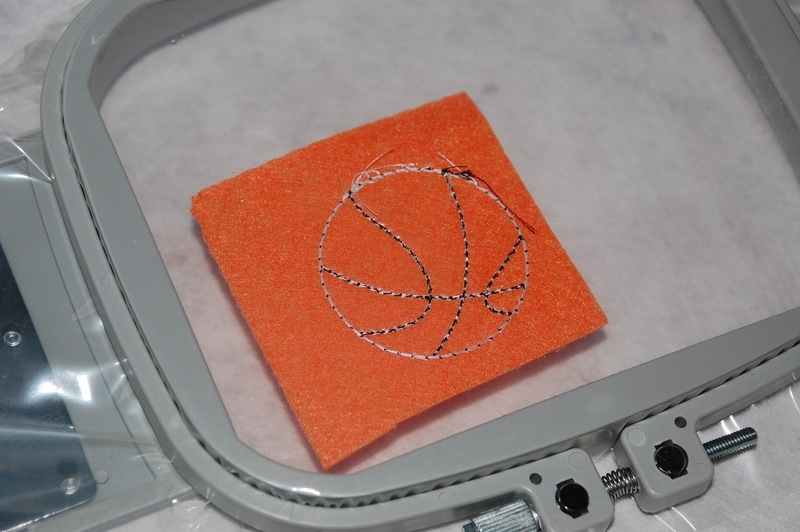 Turn your hoop right side up and snap back into place. Stitch that final securing tackdown line. 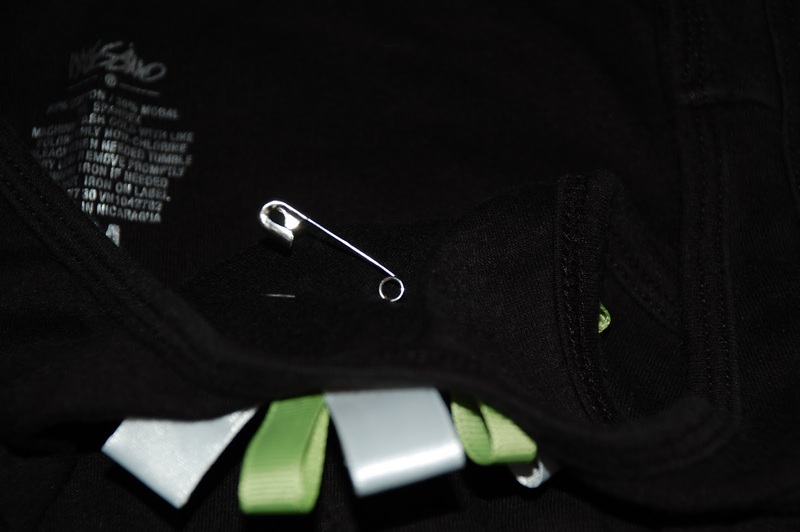 Grab a safety pin and pin to your shirt! Hopefully you are having fun thinking "outside of the box!" 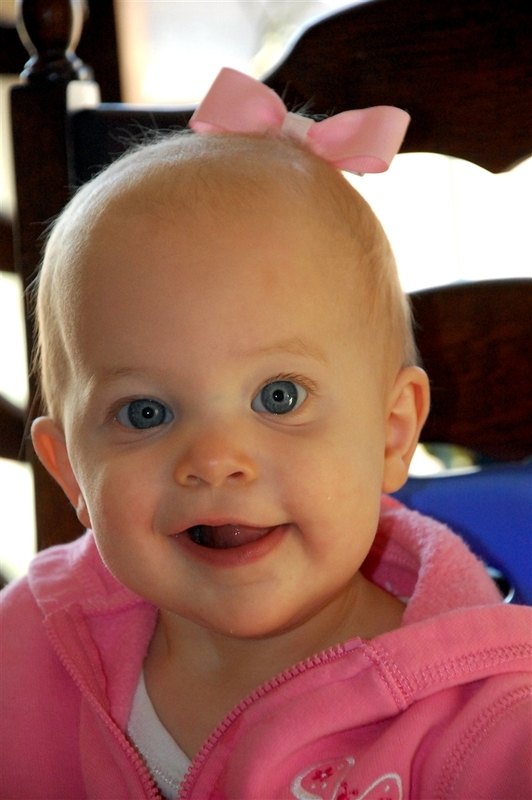 I have two daughters (and two boys, but this post has nothing to do with them); a 6 year old who thinks she is 16 and spends all her time in the bathroom playing with her hair and a newly turned 2 year old who barely has any hair. I've made my older daughter a few clips, mostly to match her clothes or the seasons. She likes "big" so she stays with the korker bows. But, I like felties. They are cute and match exactly for any occassion! From now on you will see a lot of appliques offered in a set with matching felties (at a discounted price)! Once you know your way around the items needed, putting together a matching hair clip takes only an additional 20 minutes. At most! When you buy your design, I will included a "Notes" sheet. PLEASE read this as it will direct you to start, stop, and add additional felt at the correct times. Usually there are less then 10 steps and NO trimming until the end!! 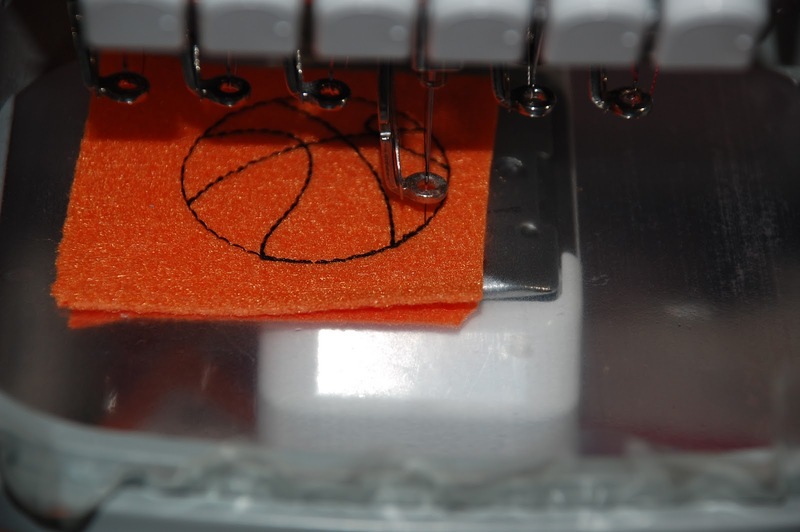 First of all you want to hoop your stabilizer. I am using a medium weight Water Soluble Stabilizer here (I would have bought heavy but can't find it in the stores). I haven't washed any of my felties, but the WSS isn't as noticeable and easy to get rid of in case these were a gift. Now, if I knew my felt were going to be white or black, I would probably use regular stabilizer since WSS is more expensive. Now stitch out your placement line. 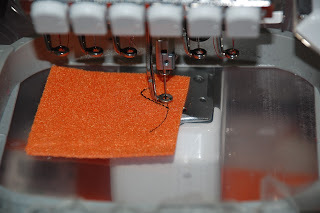 Place your felt on top and stitch out your tackdown line. Remember, this is not an applique and all the threads used will show (so make sure you get your color scheme set up first!). Stop your machine (according to the directions). 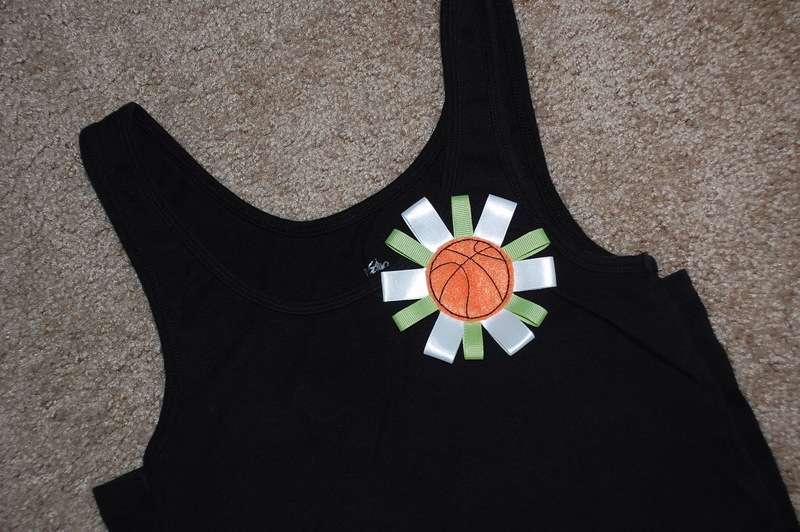 Turn your hoop over to look at the back of your design. Some designs will have a lot of detail stitched on (like the Argyle Heart Feltie) while others will have an extra layer of felt (like the Winged Heart Feltie). For the designs with extra stitching, we'll clean them up by adding a layer of felt to the back side of the hoop. That's right, spray and stick the felt to the underside of the hoop/design. Now, turn your hoop over and lock into place. Double check to make sure you didn't lose your felt (see the bottom piece still attached under there?). And stitch your final tackdown stitches. Once the design is finished stitching, unhoop and trim. Now take a look at the back of your feltie. It should be nicely covered. 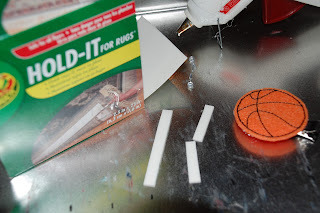 Trim any lengthy threads and if you are OCD, add some glue to make sure they won't unravel. 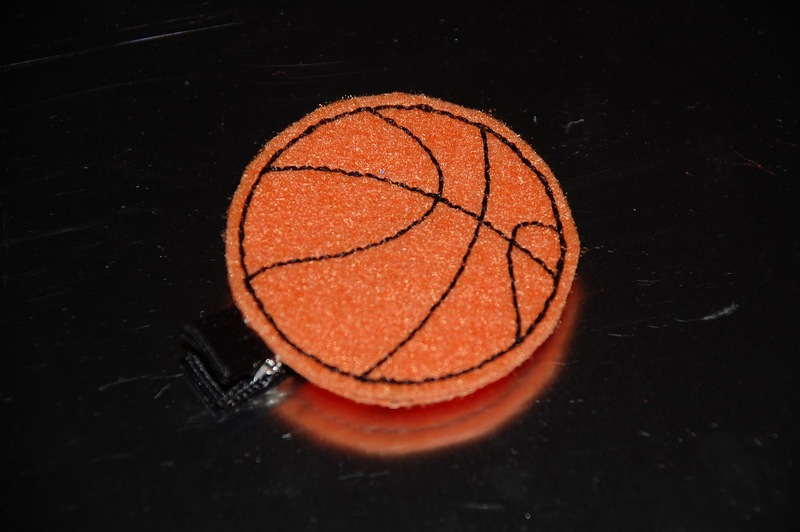 Now, everyone makes clippies differently. I use a double prong alligator clip (get the good sturdy kind!) and I'll show you why in a few. I bought a cheap (and I emphasize cheap) jelly roll pan to use as my clippie making area. 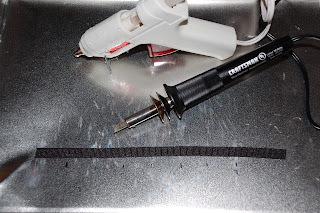 I have certain lengths measured and marked on my pan so I can easily cut my ribbon to the perfect length every time. 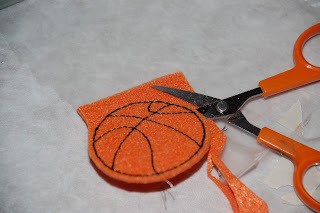 If you do not have a burning tool, cut the ribbon with scissors and use a fray check to seal the ends of the ribbon. An open flame would work too (not in addition to the fray check though, that's flammable!) 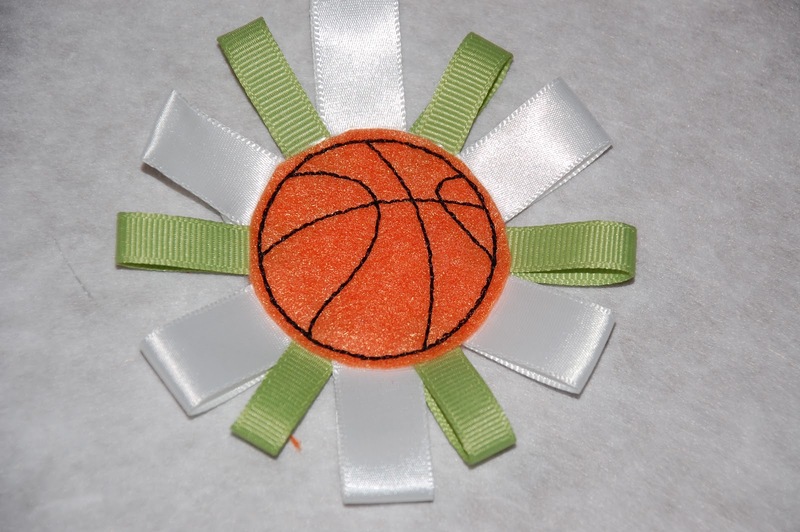 but I could never get my ends of the ribbon looking "crisp" with the flame. Or maybe they were too "crisp" and on their way to "blackened." I fully line the ribbon to my clips using hot glue. Do you see that Hold-It tape? It's awesome. Don't mind the "for rugs" part. It should really say "for thin-baby-hair-made-at-home-clippies." If your clips are always falling out, then get this stuff. Cut out a little bit and line your clips. It's the best no-slip grip ever. Seriously. It will make them slip-free. This bow stayed on my baldie for a full 30 minutes before she ripped it (and those 10 hairs it was gripping) out. Now, if your child has hair (and I really don't want to talk to you), you can always use a clear plastic ponytail holder and a partially lined clip. Clip just above the holder. That also works. For kids who have hair. Anyway, I hope you enjoy making your felties and take advantage of the upcoming sets! If you have any other tips or preferences, leave them in the comments for your fellow crafters.